What roll off dumpster size are you looking for? Everyday we’re forced to spend at least an hour doing some form of cleaning. Whether it’s our car, house, clothes, or yard, there’s always something that needs to be cleaned up. You should already know roll off dumpsters are essential for large debris cleanups caused by construction, but which one of the roll off container sizes is right for you? This basic question is often overlooked when it’s time for one to make a dumpster rental, yet it’s one the most important questions in the entire rental process. Today we’ll walk you through the different roll off container sizes to help prevent any costly mistakes in the future. If you “over rent”, by renting roll off dumpster sizes that are excessive to your own needs, you take the risk of overpaying the dumpster rental company for no reason. If you “under rent”, by renting roll off dumpster sizes that don’t hold all of your garbage or debris, you’ll have to pay an even greater fee by renting an additional dumpster. Our smallest roll off dumpsters available for rental are 10 cubic yards of volume.These roll off dumpster sizes are about 12-16 feet length, about 8 feet wide and about 3-4 feet tall. This dumpster size gives plenty of room to fit a large amount of garbage bags. These dumpsters are also suitable for small house constructions, though in that case you may wish to call Roll Off Dumpster Rental and talk to one of our representatives to make sure you won’t need a larger sized dumpster. A 12 yard dumpster has more capacity of course. It is also popular for small household uses and slightly larger projects. The 12 yard dumpster features nearly identical dimensions as the 10 yard dumpster, but has up to 3 extra feet in length to fit in those extra garbage bags, or pieces of debris. What Roll Off Dumpster Size? Renting the appropriate roll off dumpster size is extremely important. If you accidentally select a dumpster a few sizes smaller than needed.This doesn’t happen to many Roll Off Dumpster Rental customers, but we’ve heard many of these stories from customers that used to hire our competitor’s services before discovering us. We believe that customer loyalty and satisfaction is much more important to us. 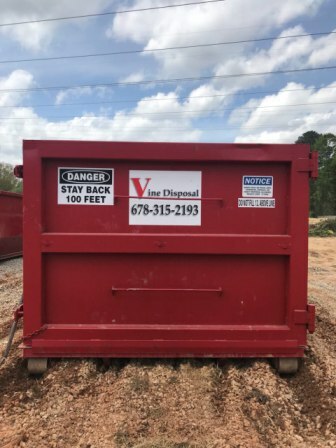 When you call Vine Disposall, on of our team members will do their best to help you select the best choice for your dumpster rental. Some small features, like well-trained employees, are what separate us from our competitors. Need a large dumpster for construction purposes? Don't worry, we have you covered. Vine Disposal offers large dumpsters specifically designed for heavy construction materials, and for traditional garbage also, with construction dumpsters that can handle up to ten tons. Our 20, 30, and 40 yard construction dumpsters offer a plenty of room to handle all the construction debris within a blink, thanks to their huge frame measuring 22 feet length, 8 feet wide, and 5-8 feet height. There are few things you can’t fit into this dumpster. Roll Off Dumpster Rental is proud to offer a superior rental service in comparison to our competitors. If you want to save time and money, there is only one choice. Call us to get started with the perfect roll off dumpster sizes today.